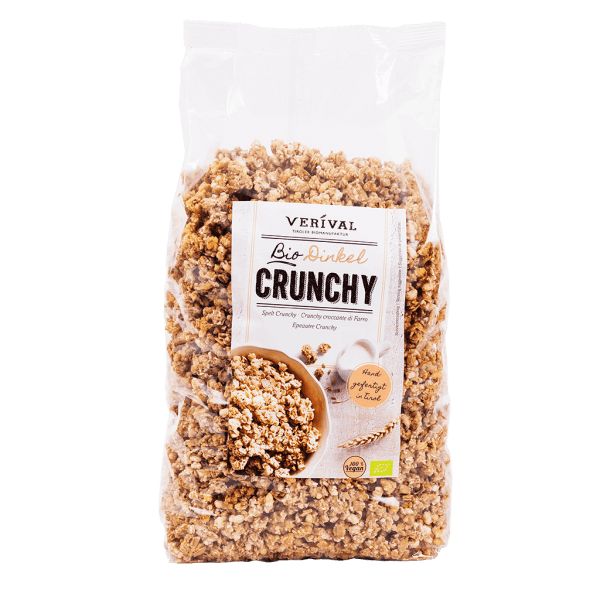 Crunchy clusters of spelt and crisped rice, toasted with sunflower oil and mixed to perfection by hand in the Austrian Tyrol. Deliciously biscuity and purely organic. Good morning! Wholegrain spelt flakes* (wheat**) 54%, raw cane sugar*, high-oleic sunflower oil*, coconut shreds*, wholegrain spelt flour* 5,6%, wholegrain crisped rice*, salt. **) According to Ordinance (EU) no. 1169/2011, ingredients produced from grains containing gluten must be clearly labeled with that type of grain. Spelt is part of the wheat family. > May contain traces of lupines, nuts, sesame seeds and soy. Best enjoyed with milk, natural yoghurt or plant based alternatives. Also perfect as a topping for your breakfast bowl or a nibble on its own. A deliciously satisfying snack, anytime.